7.95 Click on the stars to rate this FontStruction. 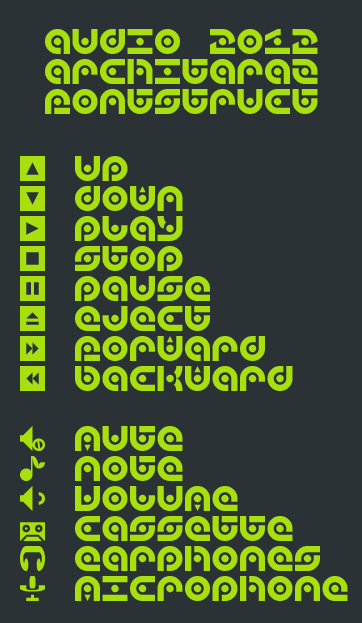 I was editing my font audio, but changes were so many that it was decided to make a new font. It's now monospaced, with no descenders or ascenders, and the dot is centered in every glyph. Added icons to make it more interesting. It's still in progress, so suggestions for buttons/icons are welcomed! Enjoy! Info: Created on 26th July 2012 . Last edited on 29th July 2012. Much more interesting than "audio", this shows how much you progressed since then. 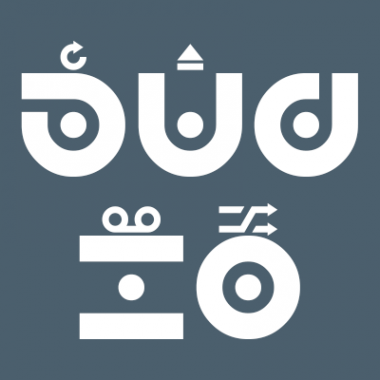 The no ascenders nor descenders choice reminds me the beautiful Neoqueto "LDR Manufacture". I'm glad to have shown it to you at the time of "audio", maybe it had some unconscious impact, cause it is much better like this. Thanks! I might take the suggestion for 8, but q's dot is not centered. I remember doing that m cause it's just the left flipped 3, so let's see what others say. Personally, i much prefer your own 8, architaraz, with its irresistible cuteness. Rj0328 one is cool in itsef, but i think it has a too much abstract feel for this specific font. 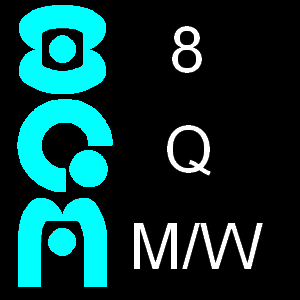 Q is wrong, as you said, and i also much prefer your own M/W solutions incorporating triangle+point as if a mini audio recorder was integrated. Ok, thanks everybody! I've changed q.
Congratulations! FontStruct Staff have deemed your FontStruction worthy of special mention. “audio 2012” is now a Top Pick. @Meek: Thank you once again! AT Audio (2013 version) released. Visit MyFonts and Behance. Thanks!